Ira Glickstein is a funny one. He writes for Anthony Watts on occasion. I don't know if he writes for anyone else. I have interpreted “majority” to mean about 70% and have therefore allocated 1°F (0.6°C) to Human-Causation and the remaining 0.4°F (0.2°C) to Natural Cycles. The seventh bar represents my personal opinion as to the actual Global Warming since 1880, discounting the “adjustments” made by the official Climate “Team” that I believe have inflated the temperature record. So, unless we believe that the world temperature record is more reliable than the US record, it is likely the world record has also been similarly “adjusted”. Therefore, I have discounted the GISS estimate of Global Warming by about 30%, so actual warming is about 1.0°F (0.6°C). As for allocation of this actual warming to Human- vs Natural-Causes, I believe the IPCC has over-estimated Climate Sensitivity by a factor of two or three, so I have allocated the majority of the warming 0.8°F (0.5°C) to Natural Cycles, and the remaining 0.2°F (0.1°C) to Human-Causation. Victor Venema is an expert on homogenisation of temperature data and has written a very good blog article about time of observation bias. These days with automatic weather stations, time of observation is no longer as big a problem. However weather stations still get moved and other things happen. If the record isn't adjusted to reflect changes, then the record won't be as accurate. Basically what Ira is saying is that he doesn't like what the data shows so he's going to make adjustments himself based on nothing at all except for his own bias and "opinion". He has plucked some numbers he likes better out of thin (if warmer) air. ... I have allocated the majority of the warming 0.8°F (0.5°C) to Natural Cycles, and the remaining 0.2°F (0.1°C) to Human-Causation. Nor does Ira say what Natural Cycles (note the capitalisation, suggesting Ira's getting on in years) could possibly have caused a rise of his 0.5°C, except for his "natural cycles". What natural cycles? Why have those cycles never cycled before? Global warming = 0.8°C - X = 0.6°C where X = Ira's opinion. The amount of warming from humans = 0.1°C which is derived from science less Ira's opinion. 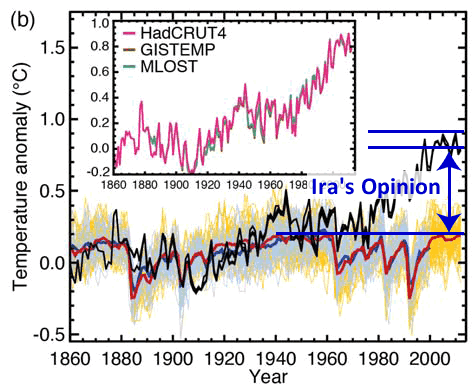 IPCC Figure TS.9 showing observations with modeled "natural" forcing only, and Ira's "opinion". Ira's opinion is not what he stated. When you look at the above chart, in Ira's opinion, natural cycles have somehow managed to shift the temperature up by 0.6°C not 0.5°C. But I won't quibble over 0.1°C. What I will quibble about is Ira's notion of "natural cycle". Why don't the cycles cycle? Given that Ira reckon's that it's "natural cycles" that have caused almost all the warming of the past several decades, he must think we're about to get jolly cold. A cycle is a cycle so it's got to come down, right? And if it was a "natural cycle" why hasn't it shown up already as such? 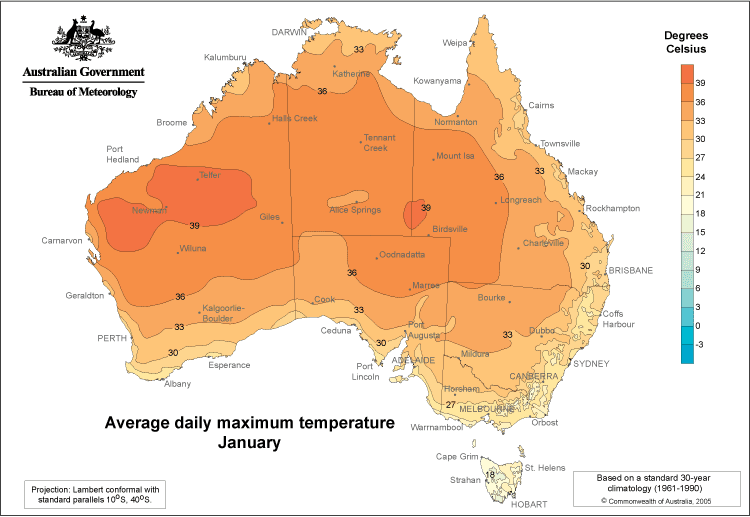 If it were a natural cycle, then it should have been as hot as it is now in the recent past. Say the natural cycle had a period of 60 years. That would mean that sixty years ago it should have been as warm as it is today. Or if you like, as warm as it is today minus Ira's 0.1°C. It didn't happen. Ergo, Ira is wrong. Well, you knew that already, didn't you. He's not just wrong in his "opinion" about the temperature record. He's not just wrong in his "opinion" about climate sensitivity. He's also wrong in his "opinion" about natural cycles. I like the point you are making, but that’s a pretty confusing graph. A straightforward bar graph, without the pictures, would be easier to follow. The graphic is too cluttered. The valid points being made in the text are not being reinforced as well as they should be. It would be nice to see a bargraph of typical daily/yearly variation (range) before warming next to the same thing after warming, it would illustrate that the warming was insignificant compared to daily/yearly fluctuations and that for most of each day/year the temperature after warming was within the normal range that occured before warming. This is, of course, why the climate deceit community prefer to use a temperature anomaly instead of actual temperatures, because the numbers just aren’t scary at all. Maybe where jaffa lives he's not had the sort of heat that some of us have endured lately. Compare the following two charts (click to enlarge them) and it's only just beginning. 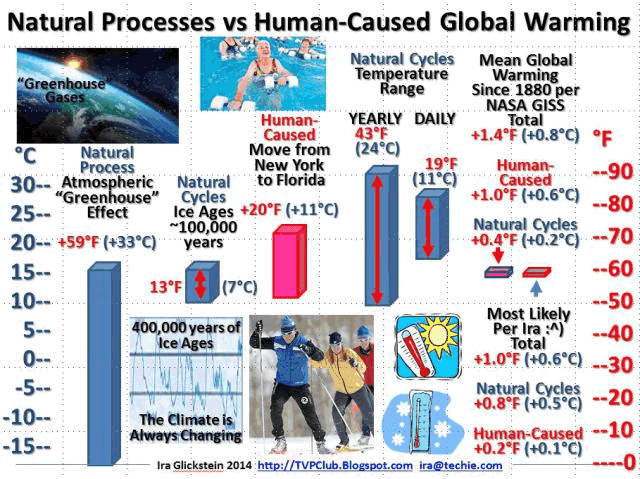 What “human-caused warming”? There very well could be a tiny amount, but if there, it gets lost in the noise of a complex, multi-layered, somewhat chaotic, and not well understood system. For all intents and purposes, even if theory says it should be there, it is non-existant. It is too small to ferret out, and too small to matter in the slightest. steveta, looks like you fell for the trick question. The language used by climate change believers and alarmists is often filled with deliberately confusing statements and concepts. In order to double a temperature you need to be aware of where your zero is (and I don’t mean the Oval Office). The only zero that makes universal sense is K.
It was 10C today. Tomorrow will be 20C. The temperature will not even remotely double. It’s always ‘radiation transfer’ with both sceptics and warmists. I’ve heard very little discussion about kinetic energy. A gas does not have ‘temperature’, it has kinetic energy that manifests itself as ‘temperature’ when it is involved in a physical contact with a surface or another molecule of gas ie exchange of energy. Why this process is never mentioned, I don’t understand. Here in Ottawa we have a 60-70 degree C yearly temperature range..a good reason why rational Canadians should ignore the alarmism. On a related note: in the recently released IPCC impact statement the positive benefits to Canada of warming are trivialized. I cannot think of any negative impacts of 1-2C warming. I am sure the same case could be made for Russia, Scandinavia, Mongolia, etc. Actually, it has got to be a supernatural cycle because any natural mechanism capable of causing a global temperature shift over 50 years or so would be pretty easy to identify. This is an invisible thing: something truly miraculous. My guess is its fairies. Perhaps I should tell Ira to go check the bottom of his garden. Ira's skills at scence put me to shame. Over the course of years, I read papers and listening to talks by the likes of Huber, Rohling, Glickson and Opdyke, discussing the issue with peers and mentors to understand climate sensitvity. Ira, in one blog post, turns all thEIR careful analysis on its head with his unique insight. A true giant in his field. Yup. Never mind that everything known about paleoclimate behaviour suggests that Glickstein and all the rest of the "lukewarmers" are under-estimating sensitivity. Which, as Sou points out, requires denying the scientific evidence. You mention Rohling and Huber, which brings to mind the last 65Ma of paleoclimate behaviour and what we can infer from it, something examined in great detail by the PALAEOSENS project: Rohling et al. (2012) Making sense of Palaeoclimate sensitivity. From what you write I imagine that you are familiar with this - the link is intended for others interested in the weak case for very low S.
Mike (WUWT): "On a related note: in the recently released IPCC impact statement the positive benefits to Canada of warming are trivialized. I cannot think of any negative impacts of 1-2C warming." How about the negative impact (why not use "effect"?) of many millions of climate refugees wanting to move to Canada because their homes have become uninhabitable? What about sea level rise - is all of Canada 60m above current sea level, or are some cities going to be flooded? That's TWO "negative impacts" in less than 10 seconds of thinking. Obviously WUWT commenters don't think much. and permafrost thawing already running, which make the soils softer and thus drained by waves. A couple of towns were already relocated. Of course, these were mostly native towns, so in the current conservative canadian mind this is not important, Oil is. Don't forget the beetles busily eating their way east through the boreal forest. My personal opinion as to the actual acceleration due to gravity is 1 m/s/s. The rest is due to 'adjustments' made by 'alarmist' scientists, so it therefore doesn't exist. You see, I'm not crazy. I'm a sceptic. What is the deal with sceptics trying to rewrite the laws of physics despite all of the previous observations and measurements. If you apply the same logic to other known physical processes like gravity, you sound like a complete loon who should be rushed off to the closest mental institution. But with climate science, it's considered OK by deniers. You can't just ignore dozens of published papers in respectable journals, and then just say, oh it's my opinion, they are wrong. I pulled this new figure from my arse because I don't like what the current science is and to address the problem means that I might have to pay a tax, or reduce my usage of dead dinosaurs. It's just plain crazy. Yet this is what we get from deniers with a straight face. Insane eh. or, as in the case of "Alex", start trumpeting something really quite basic and widely-known, as if no-one else had ever considered it before. Gravity is our number one enemy! Thank God some people have been willing to stand up to science and fight it! a solid 520 milliTimeCubes at least, by my reckoning. Ira Glickstein: "The seventh bar represents my personal opinion as to the actual Global Warming since 1880, discounting the “adjustments” made by the official Climate “Team” that I believe have inflated the temperature record. We know that the US thermometer record is so unreliable that it has had to be “adjusted” several times by the official US Climate “Team” at GISS, see The Past is Not What it Used to Be, and Skeptic Strategy." These numbers sounds suspiciously like the ones of the Global Historical Climate Network version 3 (GHCNv3) of NOAA, not of GISS. In this dataset the raw data has a trend since 1880 of 0.6°C per century (Glickstein's number). After removing non-climatic effects by homogenization, the trend is increased to 0.8°C per century. So his personal opinion is that those non-climatic effects should not be removed. It would be nice if he had some reasons why these non-climatic effects should not be removed or why the methods used to do so would produce a trend bias when there is none. WUWT and Co. go on an on about the influence of urbanization on the global mean temperature. They want to remove this non-climatic effect. You surely do not want to correct for one non-climatic effect only, but for all. At least if you are interested in accurate data on the changes in the climate system. There are many reasons to expect that early measurements were biased to be too warm. The protection against solar radiation on the thermometer and against heat radiation from the ground was not as good as it is nowadays. Many stations started in the cities and are nowadays at airports or in the suburbs, which are less influenced by the urban heat island. I would personally also expect that modern ventilated measurements would produce lower modern temperatures, but there is no evidence for that yet. What a classic case of denialist incompetence/laziness! Raw and adjusted/homogenized global temperature data-sets are freely available on line (Mr. Glickstein, meet Mr. Google. Mr. Google, meet Mr. Glickstein). Furthermore, a basic area-weighted temperature-anomaly averaging routine that produces results *very* similar to the NASA/NOAA published results isn't all that hard for a run-of-the-mill programmer to code up. Given the above, it is not hard at all to show that global-average warming figures produced by raw and adjusted data differ by far less than 30 percent. *This* is not a matter of opinion -- it's what you get when you actually roll up your sleeves and crunch the data. And for a competent programmer/analyst, it's a few days of work *at most*. Watts and Co have been going on and on for *years* about the global temperature record -- but Watts and his followers have been unwilling (or more likely, unable) to invest in a few days' worth of programming/analysis effort to test their claims about the temperature data. The bottom line is -- Watts and his followers are just a bunch of hopelessly incompetent cranks who have in *years* been unable to perform a few *days* of real analysis work. "[...] Watts and his followers have been unwilling (or more likely, unable) to invest in a few days' worth of programming/analysis effort to test their claims about the temperature data." i don't doubt that's the case, but they also know they don't need to. they've got a talking point that a great many ignorant people will uncritically repeat every time climate change is mentioned. Data is for demanding and disparaging, not for using. If you use it you end up with fiascos like BEST.